Program Notes: Water is the main carrier of life. Latest insights have shown, that water reacts very sensitively not only to physical impacts, but also to thoughts and emotions. Dr. Masaru Emoto claims that he has found evidence that water can carry energy and stores information. Using high-speed photography, he discovered that crystals formed in frozen water reveal changes when specific, concentrated thoughts are directed toward them. He found that water exposed to loving words shows brilliant, complex, and colorful snowflake patterns. In contrast, polluted water, or water exposed to negative thoughts, forms incomplete asymmetrical patterns with dull colors. 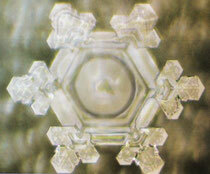 Dr. Emoto´s work is controversial – but fascinating nevertheless. If he were right, we would have a scientific proof, that treating water (and more general nature) with respect would have a direct and positive impact on humans. The Composition: E is the central pitch of this piece. According to the Russian composer Alla Elana Cohen E (besides Eb and G) is assigned to the element water. The composition is divided into four sections. The piano part of section 1 with its repetitive structure is meant to describe the unchangeable force that’s within everything that is matter (i.e. water). It is based on the overtone series of E, resembling the most fundamental principal of energy within the cosmos. The other instruments represent the drama of human life. They influence and eventually alter the piano part leading to an emotionally intense climax. In the 2nd section the piano part is now based on the octatonic scale, a symmetrical (therefore “artificial”) scale, which is not represented in nature. This should show the results of our current lifestyle that is in disharmony with nature, leading to the pollution of water and nature in general. In the 3rd section the winds and the violin pick up the opening idea of the piano, now beginning to experiment and adapt it in different ways. They finally adjust themselves to the principals of nature and all instruments join together for the 4th part, which is meant to show the positive transformation of matter through the power thought.